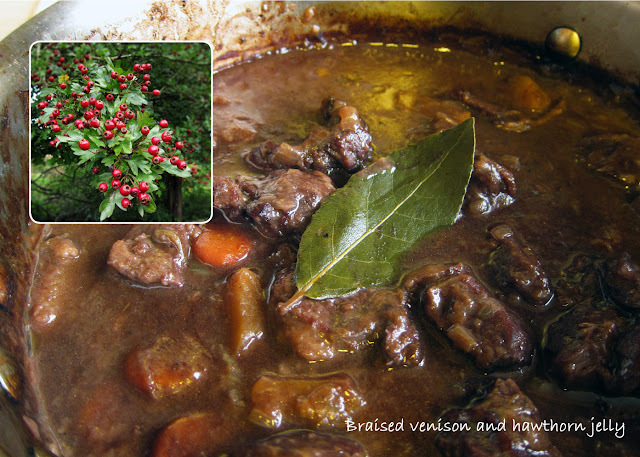 A hearty solstice stew with the addition of hawthorn jelly. Heat oven to 180C/fan 160C/gas 4. Fry the vegetables in a little oil in a heavy-based casserole for 4-5 mins until golden. Tip in the garlic and fry for a further min, then set aside. Put the venison into a plastic bag with seasoned flour and shake to coat. Add a little more oil and butter to the pan, then fry the venison over a high heat, stirring now and then, until well browned. Don't crowd the pan - cook in batches if necessary. Set aside with the vegetables. Add the hawthorn jelly and wine to the pan, and bring to the boil, scraping up all the bits that have stuck to the bottom. Pour in the stock, then add the thyme, bay leaf, meat and vegetables. Season if you like and bring to the boil. Cover and transfer to the oven for about 1½ hrs or until tender. Remove from the oven and check the seasoning.